Please scroll down to see our mouth watering specialties including vegetarian, vegan and meat lover menu items, as well as beverages and desserts. Whole lamb and spring lamb legs roasted on the spit for hours then delicately cut into bite size pieces and served in a pita wrap with fresh lettuce, tomatoes and our special garlic sauce. Prepared in the traditional Kfeirian Mountain Village Style. A tradition which originated in the foothills of Mount Hermon in Southern Lebanon, this lamb sandwich will make you dream of eating another one. 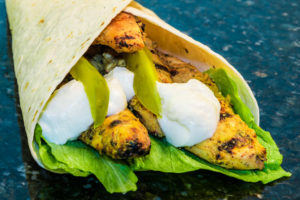 Tender, low-fat, chicken marinated in our specially imported spices from ancient Syrian trade routes and then grilled to perfection. Served on a pita with fresh vegetables and topped off with a special sauce. You have never had chicken like this! 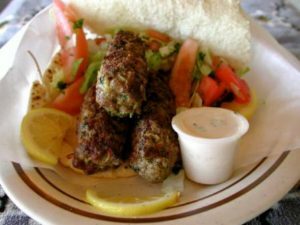 Lean ground beef and lamb mixed with parsley, sweet onions and our special spices from Zahle, Lebanon, where Kafta is said to have originated. Grilled and served on a pita with fresh vegetables and a special sauce. 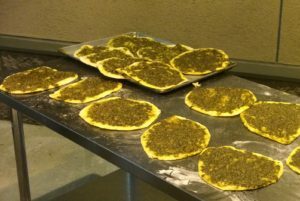 The Lebanese equivalent to hamburger, except better. A classic that needs no introduction. A generous amount of gyro meat cut from our upright broilers, served with our delicious homemade tadziki sauce and fresh vegetables. Our Kibby, from a century old recipe, is moist, juicy, and melts in your mouth! 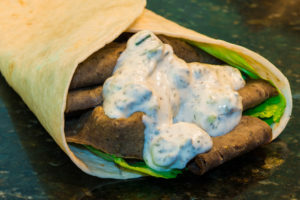 Add fresh vegetables, our secret sauce, wrap it up in a pita and you have a meal fit for a king! 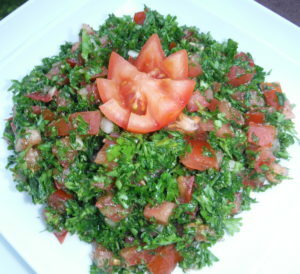 Freshly chopped parsley, tomatoes and cracked wheat mixed with olive oil and fresh lemon juice. When chick peas and tahini kiss in the blender, with a touch of lemon and garlic, only good things can happen! A patty made from a secret mixture of vegetables and spices, deep fried for your vegan enjoyment. Served on a pita with fresh vegetables and our special tahini sauce. 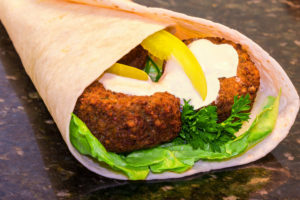 The best falafel this side of the Berdouni river. 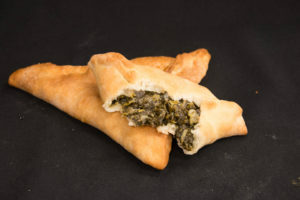 Fresh spinach and lemon juice wrapped in freshly prepared dough and baked to a golden brown. Another vegan delicacy. Also known as Manoushee. We serve it two ways. Or try it with a mild white cheese blend, atop our fresh dough. Both are fire-baked in our traditional oven. 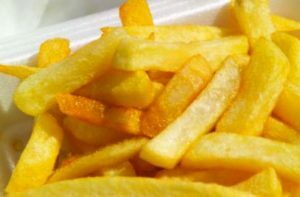 Select cut French fries seasoned to perfection and served generously. 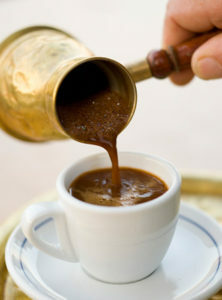 The Middle East is known for it’s hospitality and generosity. When you are invited into someone’s home, you will be served a feast, that’s just the way it is! 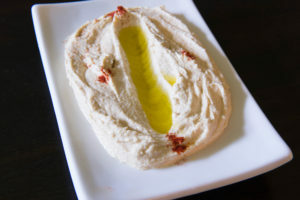 So, enjoy this luscious feast of Chicken Kabob, Kafta Kabob, Gyros, Falafel, and generous portions of freshly prepared Hummus, Tabouli Salad, our homemade sauces and fresh Pita Bread. It’s sure to satisfy! So, Ahla wa Sahla, come on in and join the family! Welcome to our home and Sahtein! 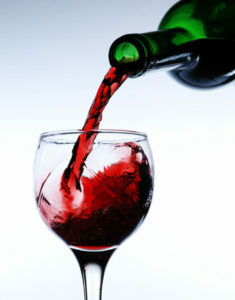 To your health! 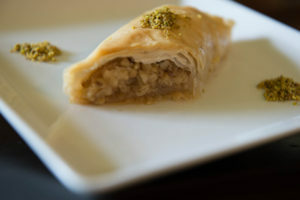 You say Baklava, I say Baklawa….Let’s have an ice cold treat. 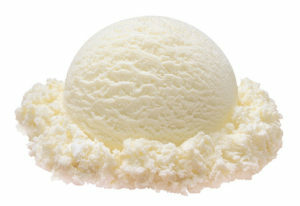 Choice vanilla ice cream topped with crumbled bits of our homemade Baklawa pastry. 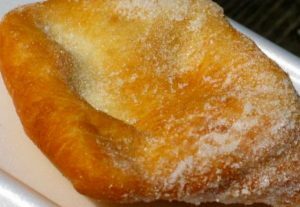 Deep fried fresh dough sprinkled with sugar. 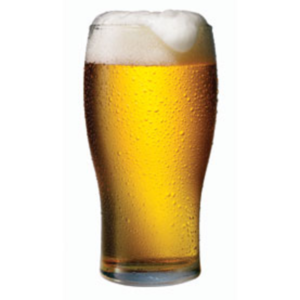 Domestic beer on tap and served ice cold.